A Gerber multitool is a compact multi-function tool made by Gerber Legendary Blades, part of the Fiskars Corporation. 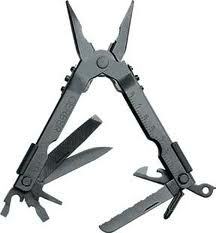 There are similarities and differences between the Gerber multitool and tools made by Leatherman. Some of the Gerber tools are accessed by opening the handles, but no longer unique to Gerber is a system in which the pliers slide straight out from the end. The sliding Safe-T-Loc system (similar to the Blacie Collins "Bolt Action" lock) locks each tool securely in place.